Finally the app I have been waiting for has arrived. An app that allows for simultaneous recording and playback. Simply set the desired “delay” and start recording. The app will record video without audio, then commence playback after the delay period has expired. The app will continue to record as it plays back the footage. This provides teachers with the capacity to setup an iPhone/iPod on a fixed position with a 10 second (or greater delay) allowing for plenty of time for students to return to the device after performance to review. Simple to use and free. A must have. Tap-a-Lap is a useful lap counting tool that can be used to record/predict metrics during a run/walk/ride etc. Simply set the distance per lap and the distance you would like to complete. As you complete a lap/students complete a lap, simply tap “lap” to update information such as speed, distance, average speed, remaining time etc. Another social fitness app that allows you to log your workouts, connect with friends and join challenges. I really like how the app provides you with an overall fitness rating as a simple number based on your workouts. Although this app is essentially a calorie counting tool, it does provide opportunities to teach theoretical concepts on healthy foods and exercise. The app allows for the simple tracking of all food and drinks over the course of the day, exercise can then be added to the mix to help balance consumption. I plan to use this app with my senior physical education students as a diary for them to track the food groups they consume in the lead up to competition. It will also provide us with opportunities to discuss exercise metabolism and other physiological concepts. A simple app, that does one thing. Records using the video camera for a designated period (5 sec – 5 minutes), followed by immediate playback. This automated process means that students can easily film a peer’s technique, and quickly review, speeding up the time it would take to initiate playback. Simple, yet highly effective. Although not a new app, it is something I am using at present to move from a comfortable 5km run to 10km in preparation for the Run With The Kids charity run in April this year. The app guides users through an interval training program of increased duration, resulting in an eventual solid 10km run. The app could be used to look at training principles or concepts such as progressive overload and diminishing returns. The final app featured inside of the above image is “MusicWorkout” which is currently awaiting release from the app store. Expect a blog post of its features very soon. Hi! I am Sara Cardwell, and I was assigned to your blog for my EDM 310 C4T assignment. I commented on your blog, Top “APPS” for PE teachers-Part 8. With reading your previous post about apps for pe teachers to use, I found out several of them are ones that I could use for myself. One app from this current post that I actually use if MyFitness Pal. I find it very helpful when one is counting calories and watching their weight. The app has a wide variety of things that one can do on it. For example count calories and exercise. 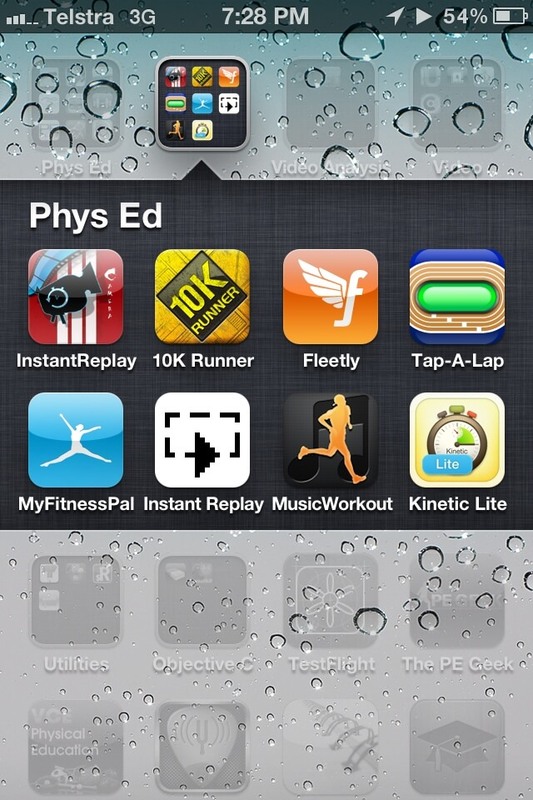 I would also like to thank you for posting these blogs about apps for PE teachers. One reason being is even though I am not a PE teacher, there are some apps that I can use in my everyday life. Hi Mr Robbo. Just wanted to let you know that your blog is absolutely amazing and is keeping me up at nights (I keep reading it) and is completely taking me away from my work (thanks!!). I went looking for some new apps to use in my classes and stumbled across your blog. It’s totally a one stop shop and an absolute wealth of information!! Thanks so much for the hard work and research you have been putting in and then sharing it with us. What a legend. I am constantly looking for new tech ideas to incorporate into my PE classes and many of the apps you have suggested would be incredible. I teach in a private school so a lot of the kids are cruising around with the latest smartphone. I need to see what our school policy regarding cellphones in class is…..there’s an exception to every rule right. I see though that you are an Apple geek while I am a bit more hooked on the Android platform. I tried to do some searches last night to see if I could find any comparable Android apps to some of the Iphone ones that you are writing about. I did stumble across the “Fast Burst Camera” which may or may not come in handy in my PE classes but it sure was fun to use on my colleagues in the office! Anyway thanks again for this fabulous site. I’m really enjoying going through each of your articles and pulling out some amazing ideas that I would like to use. I thought I was the geekiest PE teacher around but you totally take the cake. Fab job.